According to The WB, Thursday's 100th episode of Smallville drew 6.3 million total viewers and set network time period records in ratings. Records were set in adults 18-34 (3.3 rating/10 share), persons 13-34 (3.2/10), men 18-34 (3.7/13) and men 12-34 (3.6/12). Its ratings in adults 18-49 (2.8/8) and men 18-49 (3.2/9) as well as in total viewers (6.3 million) were the second-highest in network time period history. "Reckoning," in which Jonathan Kent died, placed No. 1 in its time period among adults 18-34 (3.3/10), persons 12-34 (3.2/10), men 18-34 (3.7/13), men 12-34 (3.6/12), men 18-49 (3.2/9), teens (2.8/9) and male teens (3.3/11). Compared to the parallel week last season, Smallville achieved triple-digit gains over the parallel Thursday last season in every key demo, including 313 perecent in adults 18-34 (3.3/10), 300 percent in persons 12-34 (3.2/10), 211 percent in adults 18-49 (2.8/8), 3250 percent in teens (2.8/9) and 127 percent in total viewers. 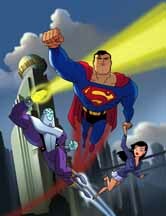 Cartoon Network has provided The Continuum with a schedule of Krypto, the Superdog episodes for Feb. 6-March 5. * Monday, Feb. 6: "The Living End" and "The Dog Days of Winter." * Tuesday, Feb. 7: "Bad Hair Day" and "The Cat and The Bat." * Wednesday, Feb. 8: "Melanie's Monkey" and "Funny Business." * Thursday, Feb. 9: "Now You See Him" and "Bones of Contention." * Friday, Feb. 10: "Superdog? Who's Superdog?" and "The Good Life." * Monday, Feb. 13: "Streaky's Super Cat Tale" and "The New Recruit." * Tuesday, Feb. 14: "Up, Up and Away" and "Dinosaur Time." * Wednesday, Feb. 15: "Puppy Problems" and "Switching Sides." * Thursday, Feb. 16: "Leaf of Absence" and "Big Sister." * Friday, Feb. 17: "Bat Hound Meets the Dog Stars" and "A Dog's Life." * Tuesday, Feb. 21: "Bat Hound and the Robin" and "Furry Fish." * Wednesday, Feb. 22: "Tusky's Tooth" and "When Penguins Fly." * Thursday, Feb. 23: "Krypto's Scrypto, Parts 1 and 2." * Friday, Feb. 24: "Super Flea" and "A Bug's Strife." * Monday, Feb. 27: "Meet the Dog Stars" and "The Streaky Story." * Tuesday, Feb. 28: "Diaper Madness" and "Feline Fatale." * Wednesday, March 1: "Dog-Gone Kevin" and "The Dark Hound Strikes!" * Thursday, March 2: "My Pet Boy" and "Dem Bones." * Friday, March 3: "Bat Hound for a Day" and "Dog Bot." For covers and four-page previews of Dark Horse Comics titles arriving in stores on Wednesday, CLICK HERE. Titles include The Perhapanauts #3 and Super Manga Blast! #59. 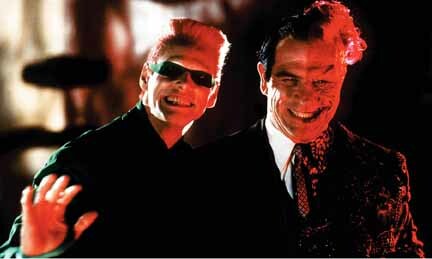 * TNT will air Batman Forever on Monday, Feb. 27 at 1 a.m.
* Coming Monday: DC news -- and much more!! !